Back when I decided to start some discussion groups this week, I had grand plans for how I would model the groups. I wanted to get teachers together, three or four of us, and record us having a real conversation about a book that was familiar to the students. Well...this didn't happen! (It was hard enough for me to coordinate my own movements this week, let alone rope three people into a crazy scheme.) When it came time to model discussion groups, I decided to let some stuffed bears do the talking. Using Weslandia, which had been a read aloud from earlier in the week, I moved the bears around and used different voices to show how a discussion group should go. We talked about interesting questions versus non-interesting questions, polite ways to speak to each other, and how to invite others to participate. It worked wonderfully! The kids loved watching the bears (and helpfully reminded me which voice went with which.) Even more importantly, the bears gave me a chance to show students some common problems with discussion groups. After we worked with the bears, we wrote down some rules for our discussion groups. I was faithful to what they put forward as rules they wanted everyone to follow. Then, students returned to their seats to write down two questions to bring to their group meeting, I pulled Popsicle sticks to make the groups, and we jumped right in. The groups did not go perfectly, but there were several interesting discussions. I heard good indicator comments--students said things like, "I never thought about it that way before." They all had questions to share, questions that went beyond the literal. It helped that we were reading The Magic Key, a story that I wrote. Students still had some questions about whether or not the key was magic and how the door opened. After about eight minutes, I pulled students back together to talk about our experience. This is important in the early days of discussion groups--leave them wanting more. Students rated the experience on a scale of 0-5, with 5 being as much fun as a reading activity can be. Scores ranged from 3 to 5, and we talked about how the discussion groups are fun in a way that may be different from what they are used to. The biggest surprise, though, came after we were finished. We had moved from the ten minutes of discussion groups and into some self-directed center time. Several girls asked me if they could borrow the bears. "We want to do another discussion group with them," they said. They pulled Don't Let the Pigeon Stay Up Late off the shelf, read it aloud to the bears, and then took turns using the bears to ask and answer questions. Fourth graders are just too cute! If you like these activities, please rate them. 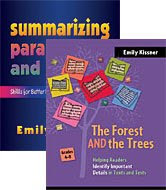 Also, check out my books from Heinemann. Links are to the right. On October 26, I'll be presenting at KSRA--"Making Inferences, Making Meaning." We'll look at lots of fun ways to help kids make inferences. But the hardest part about helping kids to make inferences is getting them to animate the process. That is, you can have a reader who can find the text clues, and has the background knowledge, but doesn't make the inferences. I think that this is because inferences depend on a reader's curiosity. If a reader has no questions, or is not engaged with a text, then that reader will not have a reason to make inferences. So, if you have students who are not making inferences, a first step may be to work on questioning strategies that get them more involved in the text. Heading to KSRA? Come and see Nicole King and I present about expository fiction--what it is, why it's a great tool for students, and how to use it to build success on the PSSA writing test. It can be easy to overlook teaching the text features of narratives. After all, kids usually seem to have an easier time understanding narratives. Also, the text features of novels and stories are not usually as obvious as the text features of expository text. But young readers, especially those making the leap into books without many pictures, need to learn how to navigate narrative text features. During read aloud, I've been showing students some of the features of the books we've been sharing. New paragraph for change of speaker: While it is obvious to skilled readers, young readers often have trouble tracking the speaker in a conversation. Recognizing that authors show the speaker by starting a new paragraph helps readers to understand who is talking. Breaks to show change of time or place: When the action in a narrative shifts, writers often signal this with a space. This tells a reader to be prepared for a change. Different fonts to signal point of view shift: Many stories are told by alternating narrators. Authors usually show this with different fonts or styles. In The Magic Thief, for example, there are occasional excerpts from Nevery's journal. These are printed on gray paper with italic text. Readers need to be able to recognize the print features that point to the narrator shift. Dates in diaries: When a narrative is told through a diary format, the author shows the passage of time with dates. These are usually written in a bold print to draw the reader's eye. Looking at these narrative text features is helping my students to add features to their writing, as well. Today, a student said, "Hey." He waited patiently at my elbow until I finished with answering another student's question. Then he showed me his journal. "I'm having two people talk in my story. And I'm using a different kind of writing to show that they are different people. Look." His handwritten attempt at a different kind of font was to make the r's backwards! What a creative way to personalize the text feature. This morning, as I was getting ready to teach about the food chain, I asked my son Zachary, a sixth grader, to make me a construction paper flower. I had several puppets that I wanted to use, but no models of green plants. Zachary agreed (I'm so lucky!) and constructed a detailed paper flower, perfectly engineered to demonstrate how my hummingbird puppet could drink nectar from it. In homeroom, students admired the flower. "Wow," one student said, when she heard that Zachary had made it. "Zachary is so creative." She thought for a moment, and then added, "He must get that from Mr. Kissner." Well, at least the lesson went well. You can find a Powerpoint that I made to teach about food chains here. As for the hummingbird--well, the puppet drank pretend nectar from the flower, and was then gobbled up by a hawk. So goes the food chain! Last week, Aidan and I visited a local park. We found some really neat acorns--smooth, shiny, and already starting to sprout! We filled our pockets to bring them home to see if we could get them to grow. Well, the next day, we had a surprise--all of the cups and pots had been knocked over! Aidan was upset, and at first blamed his older brother. But we soon realized that Zachary wasn't to blame. Two days before, Aidan had seen a squirrel in the yard, and had taken me to see where it hid under the shed. Well, it became pretty obvious who stole all of our acorns. When it came to making pictures, I had a problem. Should I draw a picture of a squirrel (much harder than acorns!) or not? I consulted with my husband, who decided wisely that a picture of a squirrel would change the entire reading experience. He is trying to get his third graders to read without relying entirely on picture clues. A picture of a squirrel would give the solution away. Instead, the reader needs to read the text to solve the mystery. Whew! I'm not sure if I could have drawn a convincing squirrel. Today, I worked with the reading strategy of summarizing. I used the Elephant and Piggie book Are You Ready to Play Outside? to model writing a summary. (I wrote about using Elephant and Piggie books for summarizing last May...this year, I decided to start early!) This book is very easy to read, but it makes a great quick introduction to writing a summary. Students can have success very quickly and write a great summary in just a few sentences. Because, in summarizing, I've found that early success is key. If readers get mired in a summary of a text that is too difficult, they'll be tempted to use unproductive strategies, such as copy and delete. Even worse, they might decide to summarize only a part of the text instead of attacking the entire thing. A good summary of a text that is below a student's reading level is better than a poor summary of a harder text. With Are You Ready to Play Outside, we read a few pages, and then put the action into a sentence. Students sat on the carpet with their notebooks and wrote along with me. For each part, I suggested a word that they could use--greet, unfortunately, however, until, finally. Some students used these words, while others branched out on their own. "What did you learn about summarizing?" I asked students. One said, "I found out that we don't have to include everything. Which is hard, because there are sometimes funny bits that we want to put in." How true! Another student said, "There are different ways to say things." And, of course, someone had to add, "Elephants do make good friends." Which is definitely true! The text structure of problem and solution explains a problem to a reader, and then offers one or more solutions. Sometimes, the text examines a problem that has already been solved. More often, the author invites the reader to contribute to the solution. Over the last few years, I've realized that I need to teach students to be critical of problem and solution texts. Often, persuasive essays use this structure. A reader needs to think, "Do I believe that this is a problem? Do I believe that these steps will be the best solution?" Complicating issues is the fact that problem and solution text is often combined with cause and effect. How are these text structures different? If there is no solution, then the text structure is cause and effect. If there is a solution, then it is problem and solution. Looking for problem/solution pieces? I've written multiple texts for Problem and Solution Texts. Many picture books show elements of this text structure, especially books with environmental themes. Melissa Stewart has written several books showing problem and solution. 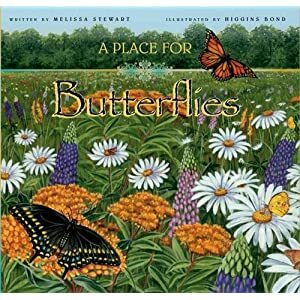 A Place for Butterflies is one of my favorites, as well as A Place for Birds. What makes these so nice is that they have simple text, but very detailed pictures. Nouns and "What's My Rule?" Fun with nouns! Well--maybe. I guess it depends on your definition of fun. While students were sharing their journal entries, I played a little game of "What's My Rule?" We do this in math class to help students recognize patterns. But it is a great grammar activity, too. I wrote down words from the text as a student read aloud, and then the students had to try to guess the rule for the list. I started out with just nouns, but branched out into common nouns, proper nouns, and plural nouns. After I made each list, students gave the list a name based on the words that I chose. It was a fun way to reinforce nouns AND look at their role in the students' writing. Each list turned out to be a little different! They led to some interesting discussions about how the content of the story is shaped by the nouns that students use. It was a quick way to show students how the abstract ideas of grammar translate into their everyday writing. This week, I worked with my students to review reading strategies. They had wonderful introductions to strategies in third grade, and really remember a great deal. I used the "Strategy Knowledge Rating" from my Reviewing Reading Strategies packet to get a snapshot of what students already know. Knowledge ratings for vocabulary can be tricky things--I've found that kids often tend to overestimate their abilities--but they are still an indicator of background knowledge. I found that kids were very confident in their ability to predict, visualize, and activate schema, but were a little less sure of how to question, infer, and clarify. (I put the items on a chart and tabulated student responses so that we could see how everyone in the class responded.) My main goal in planning lessons for strategy use, then, was to show students how to integrate strategies, using several together to build meaning. To model these reading strategies, and how they can all work together, I chose the book Nim and the War Effort. The muted, detailed illustrations grabbed my attention right away. But the setting and the plot made it perfect for these lessons. For my apple orchard rural kids, the Chinatown setting was new. Nim's family and culture were different than my students', but the main problem--Nim wants to collect the most newspapers to win a contest at school--was familiar. This combination of new and familiar is important for modeling strategy use. There needs to be something new to cause students to ask questions, but enough familiarity for students to be able to have some background knowledge to use for making inferences. Day 1: We previewed the book. Students recognized that it was a narrative (hooray!) and asked questions about the pictures. We read the first few pages. After each page, I paused for students to share their questions with a partner, and then called on a few groups to share their questions for the chart. Day 2: We continued reading, putting more questions on our chart. When we were able to answer a question, we recorded it on the chart. I led students from asking only literal questions to asking "big story questions." Day 3: I introduced inferring. We practiced making inferences by looking at pictures from my iPhoto collection. The students know both of my sons, and so they enjoyed looking at some pictures of the boys in different seasons and making inferences about what they were doing. Then, I told students that we can use the strategy of making inferences to answer some of our questions. We looked back at our two days of questions. Were there any that we could make an inference to answer? We read a few more pages, and then tried to answer some questions that were not stated directly in the text. I knew that we were having success when kids groaned when we finished! Day 4: I introduced clarifying. We talked about how it's a way for us to think about the author's words and what they meant. Once again, I read a few pages, and we collected more questions and answers. By this point, the students were very invested in the story. At the pauses, kids were talkative and eager to share with their partner. Day 5: We finished the story! What made this book perfect was the fact that the outcome of the contest was never stated directly--kids had to make an inference to figure out the ending. We talked about how, at the end of a book, we need to take some time to go back through our questions. Sometimes we'll need to make inferences to understand how it all ends. City Green, by DyAnne Disalvo-Ryan: This book has wonderful picture support that leads students straight toward the important questions and key inferences. The name of the narrator is not revealed until page 13, making this a great book for modeling to figure out who the first person narrator might be. Squanto's Journey, by Joseph Bruchac: I used this with a group of six boys. There were many opportunities for questioning and making inferences. The flashback structure made it a little more challenging. Dragonfly's Tale, by Kristina Rodanas: This one was a little harder for the group. The pictures helped them to track with the story. Train to Somewhere, by Eve Bunting: Another one with a first person narrator. Eve Bunting offers strong support for the less familiar topic. This group had some more trouble with using information from one part of the story to answer questions from an earlier part of the story. I have 26 students for reading this year. They are a lively, enthusiastic bunch and immensely fun to teach. But things have been getting a little loud. While I'm working with a guided reading group of 6-8 students, there are 18-20 other students in the room--pretty much an entire class! As a result, I've had to rethink some of my standard routines. If students are doing fluency, retelling, and word sorting, all at the same time, then we can barely hear ourselves think up at guided reading. But I don't want to just assign dull worksheets and assignments for students to complete on their own at their seats. Computer: Luckily, I have three computers in my room, and I have put them all at the other side of the room from my guided reading area. The interactive tools at readwritethink.org have been a big hit. This week, students worked with a partner to write a diamante poem. Assessment: This came from my husband, who teaches third grade. I had a short common assessment that I needed to give this week--why not do it during centers time? The students in the group sat in a quieter corner of the room and completed the task. I liked this arrangement much better than taking up some of my precious whole group instruction time for the task. Retelling: I love the retelling center so much. This year, I've managed to pull together three of the Playmobil fairy tale sets. Students read picture books that go along with the characters, and then act out the story with the sets. When the other groups are quiet, the bit of noise that comes from these groups is manageable. Any other ideas for quiet activities...that aren't dull seatwork? I am not a huge fan of acrostic poems. In my experience, they often lead to young writers valuing form over ideas--trying to cram words into the set form without really saying anything fresh or new. Silver Seeds, though, has changed my mind. This beautifully illustrated book of acrostics, written by Paul Paolilli and Dan Brewer, is a collection of lovely acrostics. Each one is about something related to nature. They go beyond the usual one word per line and share fresh, interesting comparisons and descriptions. I would enjoy reading the poems even if I didn't know that they were acrostics! I shared this with my students as we were finishing up our process paragraphs. Many students had already finished their final drafts, so I wanted to introduce a different form of writing for them to try out in their journals while the rest of the students continued to finish. This book was perfect--an introduction to a form of poetry, a chance to see how they understood metaphors (surprisingly well), and an invitation to try out a different form of writing.